Lunenburg has the distinct honour of being a UNESCO World Heritage Site. The World Heritage list is reserved for locations of unique cultural significance or natural beauty. Lunenburg is one of only two urban World Heritage Sites in continental North America (Old Quebec is the other). The town gained UNESCO distinction for its well-planned conception as a fishing village and the remarkable conservation of its original town centre, a colonial harbour settlement with impressive wooden architecture. Lunenburg is the world's best-preserved British colonial fishing village and the Lunenburg Opera House (LOH) sits at its centre. The LOH was built by the Independent Order of the Odd Fellows (IOOF), a fraternal order with origins in Britain and chapters throughout North America. The corner stone of the LOH was laid in 1907 and the first performance graced its stage in January 1909. 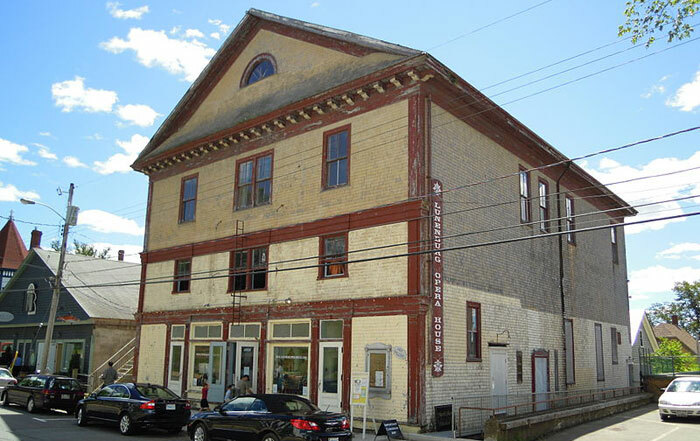 The ingenuity of Lunenburg's fine shipbuilders and craftsmen (who built the LOH) is evidenced by the unique architectural features that enhance both the acoustics and aesthetics of the building. The floor joists are laminate beams that have been steamed and made to curve in a semi-circle facing the direction of the stage, giving support to the dished floor above and enhancing the acoustics of the theatre. The joists actually mimic the unseen ribbing and framework that one might find beneath the facade of a guitar or violin or inside the hull of a wooden ship. The exterior is simple but majestic, a testament to the sensibilities of the South Shore people.